Charcoal is made by heating up wood with the lack of oxygen that allows it to char instead of burn. Once wood is turned into charcoal, it has the ability to keep its density as a solid and heat can easily be reapplied in order for it to catch fire and stay burning. Most grill masters like the flavor that penetrates the meat when cooking with charcoal over using a gas grill. Charcoal can come in differing shapes, sizes, density, and can be made of different kinds of wood. Pressed Charcoal Briquettes - Briquette is the most popular type of charcoal and is typically made by compressing smaller pieces of wood like sawdust together to form a tight lump shape. Briquettes are so popular because they tend to burn for longer periods of time and the heat is compressed into a smaller space that is easier to control. Match Light Charcoal - Match light is a feature that comes out of the bag with the ability to throw a single match on a pile of charcoal to get it lit. Typically lighting charcoal requires either a chimney starter or some lighter fluid, so match light provides the convenience to grill masters. This type of charcoal is great for camping trips where limited resources are available to get your grill or smoker going. 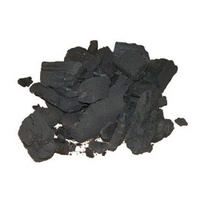 Natural Lump Charcoal - Typically made of hard woods, natural charcoal is the least popular of the different types of charcoal. The benefit of using natural lump charcoal is it provides less ash that can cause your grill to get dirty and clogged up over time. Lump charcoal also burns hotter and faster than briquettes. It can be harder to control the heat with lump charcoal, especially because of its varying size and shapes that can cause hot zones in various locations throughout your grill.